Buds relatively long and narrow, slightly curved; corolla white at base flushed pale pink towards tip (deeper pink in bud); style tip dark red; anthers brown (darker than ‘Shining Light’). Flowers: (June) July–September in cultivation. Bushy heather which responds well to pruning, with vigorous upright shoots to 0.35m tall, to 0.5m across (after 8 years in cultivation; pruned); leaves densely and evenly arranged on shoots, bright green, paler than ‘Shining Light’; marginal cilia may be gland-tipped. A selection from wild plants growing near Cabo de Peñas, Asturias, northern Spain, noticed by members of The Heather Society during a field trip in 2007. 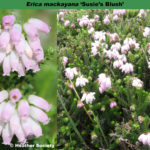 Named as a compliment to Susie Kay, Conference Manager of The Heather Society, in whose Connemara garden it has been grown, and who has propagated it. ® E.2016:02 registered by The Heather Society.